Recently on the Recumbent Trikes Group on Facebook a member of the group asked for help trying to locate a video which they said had been posted earlier in the day but later seemed to have disappeared. To make a long story short another member came up with the video for the person. I had not seen it but when I did I was impressed. So without further ado here is the video. Now I personally believe that this is neat and innovative. The idea of having one’s dog riding right alongside of you like that is super. However, I feel I need to point out that with this added width it would greatly effect places you could ride. It would be too wide for many trails as well as too dangerous riding in other places, especially where you are dealing with motor vehicles. But I agree with the concept of having the dog alongside vs. behind. 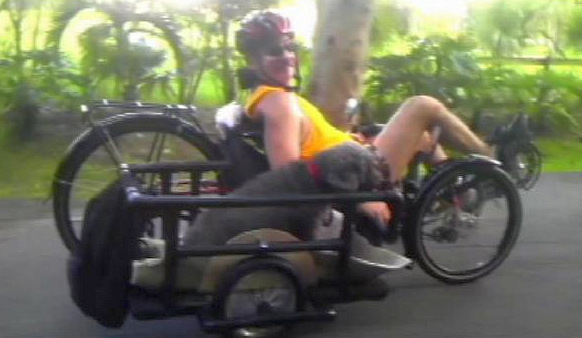 Posted on January 19, 2015, in misc., tadpole trikes and tagged dog riding on recumbent trike, recumbent trike sidecar, tadpole trike sidecar, taking a dog along on a tadpole trike. Bookmark the permalink. 1 Comment. Hi my name is mark and I create this side car. I’m sorry it’s been over a year to respond to this post. My dog loves this side car. Safty comes first for both the dog and the rider. I only ride on trails never on road unless unavoidable like crossings. The side car is so awsome that when on the trail I always get a great response from walkers,runners and other riders. As it apears wide I never have problems on bike paths and to my surprise with this attached on the side of my trike there is no drag to the right or left. It is amazing ! Even if I have to cross over some grass etc it goes effortlessly. I really outdid myself. I originally didn’t build this with the intention of selling it. But the response has been so great that I am now considering making diy plans and maybe putting together a kit. If you have any questions your welcome to contact me at cpdmark2@gmail.com. Again thank you for saying nice things about what I created. Again thanks, I really appreciate it.